At the Waterfront Shelter last Sunday, a few dozen picnickers and onlookers turned out for the phenomenon that was "Big Lady!" 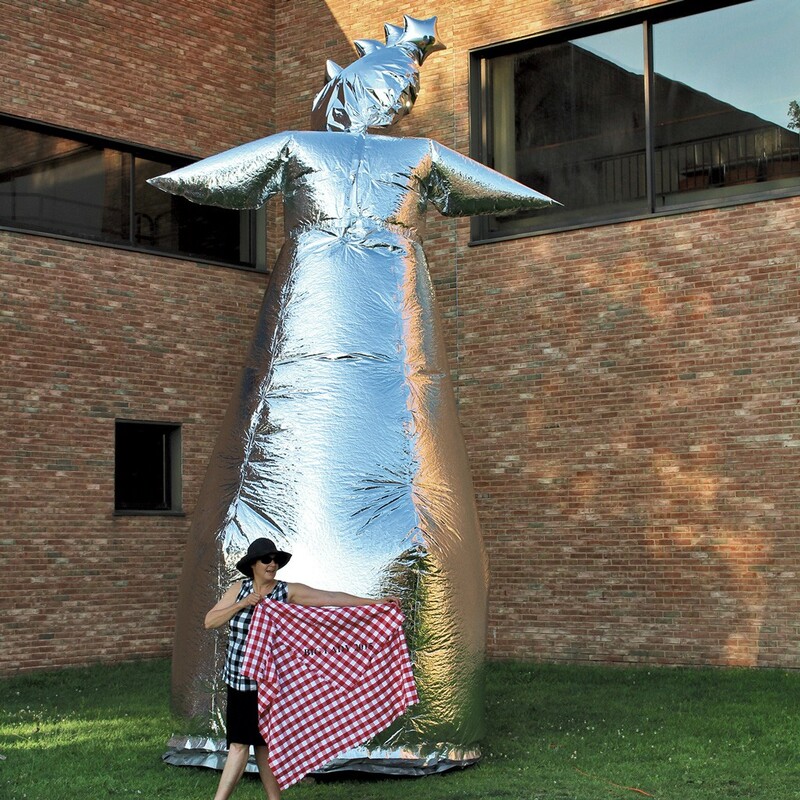 The 35-foot-high inflated woman, created by artist Stella Marrs, was the guest of honor at the laid-back Big Lady Picnic, organized by Burlington City Arts. Described on its website as "An event celebrating the 'World's Tallest Inflatable Woman,'" the gathering resembled a casual family party on a lazy summer afternoon, albeit one attended by a very large, silent, shiny female. Some attendees took advantage of the provided cut-your-own red-and-white-checked tablecloths and claimed a spot in the shade. Others stood around gawking at the silver Mylar creation while DJ Takahiko Matsui cranked out tunes. With a roundish, short-armed body filled with air and a head full of helium, Lady bobbed in the welcome breeze off Lake Champlain and didn't say a word. Marrs, whose installations and video works address feminist and environmental issues, is a participant in BCA's upcoming "Of Land and Local" exhibit opening in September. On Sunday, she looked happy, and perhaps relieved, to have pulled off — or rather, pumped up — her inflated woman. Marrs states she has sought to "redefine public space" with some of her projects. And that she did with this one. Big Lady's starry crown brought the Statue of Liberty to mind and — even without a torch — she briefly owned a corner of the Burlington waterfront. Learn more about "Of Land and Local" at burlingtoncityarts.com, and about artist Stella Marrs at stellamarrs.com. The original print version of this article was headlined "Who's That Lady?"